The Mahattan Eruv has dramatically improved our Shabbat experience and observance. It has helped our synagogues and institutions to build larger and more dedicated communities. 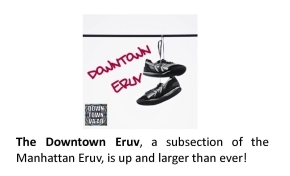 To learn more about the Eruv, click to eruv.nyc. The yearly financial Eruv obligation for maintenance and supervision of the Downtown portion of this eruv is $36k. These funds are raised by several synagogues and institutions, as well by many individuals and families that make use of the Eruv. To provide some context, if 200 individuals/families were to donate $180, our fundraising would be complete. Please consider how vital our Eruv is, how it enhances our own social and religious experience, as well as the beautiful diversity of our neighborhood, and respond generously. To make a payment, please do so below, or send a check to: The Sixth Street Community Synagogue, 325 East Sixth Street, New York NY 10003. 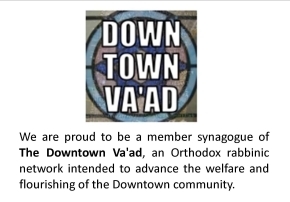 If you send a check, be sure to specify that this donation is for the Rabbi's Discretionary Fund and for the Eruv.